I'm worried that some days I'll forget to stop and look, and these days will pass me by. 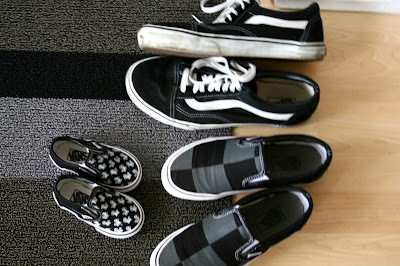 My days spent with my little girl, who is trying on my Vans and hugging my leg and doing a little dance. All at the same time. I'm thankful for the simple life. Complicated only slightly by a toddler who will turn two in a few months, with ideas and convictions of her own. But really, I've been thinking lately that these are quite possibly the most fun years of my life. And I don't want to miss them. Or wish them away. As busy and crazy as life gets when you add a little one to your household, it's so very sweet and wonderful. Certain things mean so much more; other things don't matter at all anymore. I've seen the transformation – I've become less selfish and more patient. For me, these are the best of times. Even though there are a lot of pretty little 'things' that I post about here - ahem, dresses and letterpressed goods and boots – I don't want anything or need anything else that I don't have. I have solid girlfriends who I keep close; who know the real me and love me come what may. (And vice-versa.) My husband is hilarious, our relationship is strong, and we don't take that for granted. My little girl makes my heart so very happy. I've never felt so much love in my life. And I'm thankful. For that. Such a beautiful post! Have a happy Thanksgiving!! For days I've been thinking of what a "horrible" thanksgiving I had and then I read your post and realize it wasn't so bad. I actually had a wonderful thanksgiving b/c I spent it with my precious family and even though my boys were quite frankly little terrors-I wouldn't be where I'm at today without them. You've put things into perspective for me and made me realize i need to take each day as it comes and to enjoy and cherish what I have. So along with being thankful for my family, health and friends, I'm also thankful for bloggers that I don't really know but who inspire me each day-not only in scrapping but in life.